The Annual General Meeting of the Metlakatla Development Corporation will take place on November 21, 2018 in Metlakatla. Please click here to see the notice of meeting. Please see the attached notice regarding fare collection on the Metlakatla Ferry Service. Click here to view an invitiation to a career fair for Metlakatla members on Friday, March 2 at the North Coast Convention Centre. 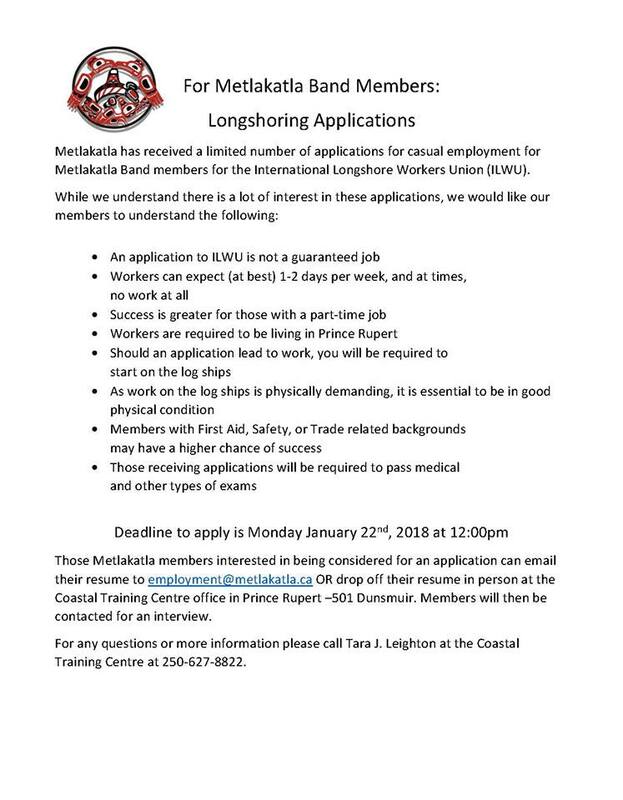 Please see the attached notice from the Metlakatla Employment Coordinator regarding ILWU applications. All Metlakatla members over the age of 18 are invited to attend the Annual general Meeting of the Metlakatla Development Corporation on Wednesday, November 22. Click here for more information. MDC Education, Training and Employment Strategy - Submit your resume for a chance to win a cash prize!